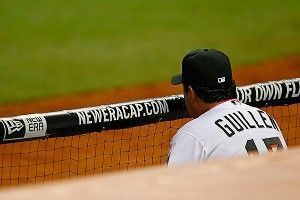 Anyone who wants to catch Marlins manager Ozzie Guillen address his comments about Fidel Castro should probably head over to MLB.com or Marlins.com, where his remarks will be live-streamed. Or you could watch on ESPN or ESPN.com. Or wait for Twitter to blow up. Lots of options here. The press conference in Miami is scheduled to start at 10:30 a.m. ET. Diamond Reflections: The Arlington Sprinkler!